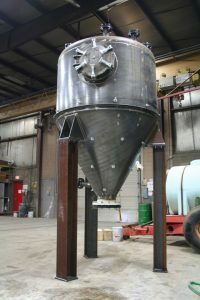 ASME Pressure Vessels - Imperial Industries Inc.
All Imperial bulk storage tanks and silos are manufactured in accordance with American Society of Mechanical Engineers standards. Imperial has been issued a “U” stamp for fabrication of pressure vessels, and an “R” stamp for repairs and alterations, allowing for the fabrication of tanks and vessels exceeding 15 PSI and going up to 3000 PSI internal. As an ASME-certified team, Imperial proudly upholds the highest standards for industry compliance and safety – just as it upholds a commitment to unmatched workmanship. Requesting a quote or additional information on any of our products or parts is simple – let’s get started with a few details. Copyright © 2019 Imperial Industries Inc.. All Rights Reserved.